Taking attendance for classes and camps couldn't be easier, whether you're using the front desk interface or the Staff Portal! In iClassPro, Attendance doesn't just mean marking a student "Present" or "Absent" -- it brings a whole host of requested features that we have collected from our customers! Click here to learn more about the features for front desk staff and administrators! Click here to learn more about our mobile staff portal for instructors and coaches! Continue reading below for information about settings and configuration. There are some helpful settings to allow your business to control how much your staff members can do from the app. Go to Settings > Staff Portal > General settings to control your staff portal options. Note: Don't forget to click Save Settings after making any changes! Enable Student Images in Staff Portal - determines whether staff members can take a picture of students with their mobile device to display next to the student's name and roll in the app as well as on the student's profile for office reference. Enable Staff Portal - turns the use of the staff portal on and off. Show Outstanding Balance - determines whether or not staff members can see if a customer owes the business money. Enable Check-In Mode - makes it possible for front desk staff to record attendance as students check in from the Families or Students pages (rather than the staff portal login). Show Instructors on Schedule in Staff Portal - displays instructors next to the class information in the class list in the Staff Portal (to make it easier to distinguish between classes with the same name and time for those instructors that can see more than their own classes). After configuring your staff portal to work the way you want it, you will need to make sure your staff User Groups are ready to go for attendance taking. To edit User Groups, go to Settings > Setup > Staff Settings > User Groups and double click each user group to edit that group's permissions. iClassPro - Switching this to Full enables the group to log into the main iClassPro application. Staff Portal - Switching this to Full enables the group to log into the mobile-friendly Staff Portal. Families - Full access will allow the group to access the Families page of the main iClassPro application. Attendance can be accessed from this page from the list of students under the family by clicking on the check mark icon. Students - Full access will allow the group to access the Students page of the main iClassPro application. Attendance can be accessed from this page by clicking the check mark icon next to the desired student. Classes - Full access will allow the group to access the Classes page of the main iClassPro application. Attendance can be accessed from this page by clicking the check mark icon next to the desired class. Camps - Full access will allow the group to access the Camps page of the main iClassPro application. Attendance can be accessed from this page by clicking the check mark icon next to the desired camp. Reports - Full access will allow the group to access the Reports page of the main iClassPro application. Attendance can be accessed from the Roll Sheets report. Families/Students - View options will give the group the ability to view the family and student details such as names and contact information as well as use communication tools, but not make changes. Full options will also allow changes to be made by the group. 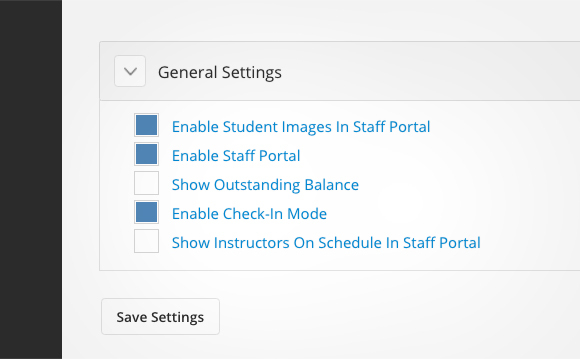 Ledgers - Full access will allow the staff member to see outstanding balances on the staff portal if "Show Outstanding Balance" is toggled in the Staff Portal settings. Enrollments - View options will allow the group to view the enrollments within a class, camp, family or student view. Full options will allow the group to also edit the enrollment. Attendance - View options will allow the group to see attendance already taken for a student/enrollment/class. Full options will allow the group to take attendance within the system. See All Classes/Camps on the Attendance Module - None will restrict the group to only viewing or taking attendance for classes/camps where they are listed as instructors. Full options will allow the group to view and/or take attendance for all classes and camps. Classes - View enables the group to view classes and class details in the main application and staff portal. Full options give the group access to editing the classes from the main application. Camps - View enables the group to view camps and camp details in the main application and staff portal. Full options give the group access to editing the camps from the main application. Roll Sheets - Full options allows the group to generate roll sheets over a given date range to take physical attendance or review past attendance by class. Absences Report - Full options allows the group to generate a report of the number of absences within a date range for classes. Where is the class attendance button? The attendance can be accessed by going to the Family or Classes page and clicking on the check mark icon. Can my staff take attendance for only one or a few students out of the class? No. Attendance (present or absent) must be recorded for all enrollments at once. It can be edited afterward for tardy students or last minute changes. While we offer "Check-In Mode", when this is enabled, taking attendance for the first student in a class will record an absence for his/her classmates until their attendance is edited. Does attendance auto-save? No. To avoid the potential of slow wireless Internet connections not recording the data in the allotted time, saving attendance is an action initiated by the staff member by clicking Submit. This also speeds up the experience and reduces data usage for mobile devices. Can I record attendance in advance? No. Attendance cannot be taken for future dates. However, you can record an expected absence or string of absences for a single student by going to the student's attendance, clicking Record Future Absence and following the on-screen instructions. This shows an alert to the staff member taking attendance so the class does not experience any unnecessary delays while waiting for the student, but the absence must still be recorded on that date.